On a same-store basis, AutoNation's new-vehicle retail sales rose 3.8 percent to 83,027 in the second quarter, just ahead of the 3.3 percent gain for all U.S. light-vehicle sales in the period. AutoNation Inc.’s net income rose 15 percent in the second quarter from the year-earlier period to $115.1 million, the company said today. Revenue rose 9 percent to $5.22 billion, boosted by higher sales volumes in all three of its segments -- premium luxury, domestic and import -- and higher revenue totals in its new vehicles, used vehicles, parts and service and finance and insurance business segments. Only “other” posted a revenue drop. CEO Mike Jackson hailed the results, and the retailer’s online sales efforts. “We are pleased with how the AutoNation brand has been embraced” since the company branded its stores nationwide as AutoNation dealerships, he said in a statement, “as well as the continued rollout of AutoNation Express and the progress of all our digital initiatives.” AutoNation Express is the company’s online sales effort. “We reconfirm our expectation of U.S. industry new vehicle unit sales to be above 17 million units in 2015,” Jackson added. On a same-store basis, new-vehicle retail sales rose 3.8 percent to 83,027, just ahead of the 3.3 percent gain for all U.S. light-vehicle sales in the quarter. Total revenue for new-vehicle sales rose 8.4 percent to $3.0 billion. Total new-vehicle gross profit rose 2.8 percent to $166.1 million, but on a per-unit-retailed basis, new-vehicle gross profit dipped 2.8 percent to $1,949. “Our most stressed segment is mid-sized cars because of the drop in gas prices, there’s also been a shift in customer demand,” Jackson told Automotive News. Retail used-vehicle sales increased 9 percent to 57,370 units, and rose 6.8 percent on a same-store basis. AutoNation’s domestic-brand segment posted the sharpest gain in income for the quarter, up 20 percent. The retailer’s luxury-brand segment recorded a 10 percent increase, while the import-brand segment posted a 3.4 percent increase. Total gross profit climbed 10 percent to $819.1 million, a record for any quarter, paced by record gross profit for parts and service, or customer care as AutoNation calls it. 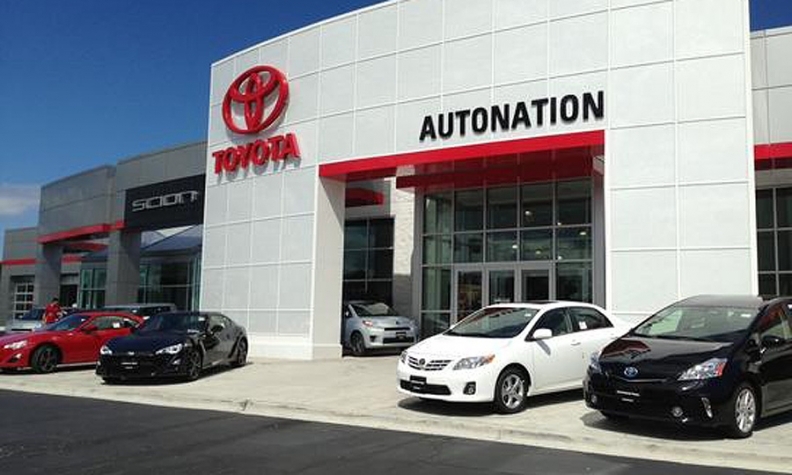 AutoNation, of Fort Lauderdale, Fla., ranks No. 1 on the Automotive News list of the top 150 dealerships based in the U.S., with total new vehicle retail sales of 318,008 units in 2014.